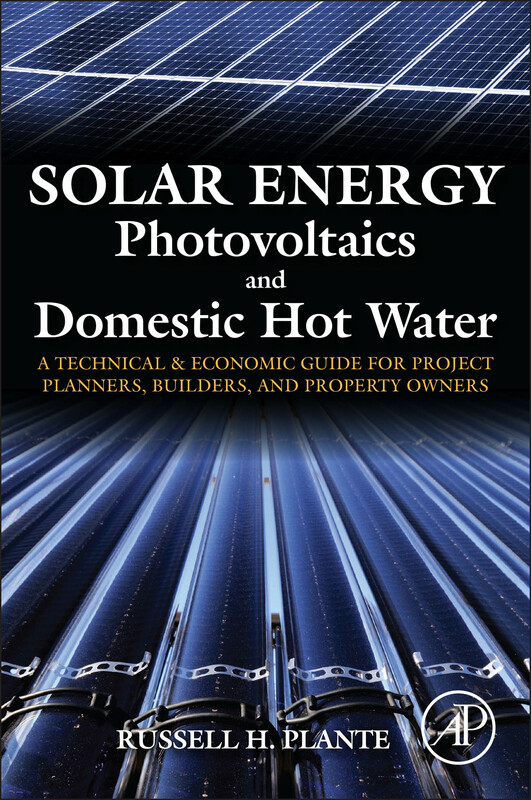 “SOLAR ENERGY – Photovoltaics, and Domestic Hot Water – A Technical & Economic Guide for Project Planners, Builders, and Property Owners” addresses the fundamental question of whether or not a solar energy system can be considered as an investment and provides economic guidelines so the reader can determine whether such a system will produce a savings in utility costs. The book provides the information needed to determine and understand the proper siting requirements, the amount of energy needed, the amount of energy available, the methods of comparing collectors for both hot water and photovoltaic situations, and the number of collectors necessary for either hot water or electricity. It also details the investment and cost savings advantages of using solar energy through comprehensive financial explanations and examples using basic engineering management analysis methods and provides a unique compilation of explanations not available in other publications or on the Internet. Examples include present and future worth relative to break-even costs, cash flow analysis, and actual quoted systems and worksheets for typical electrical solar PV and DHW demand scenarios. The book provides a valuable resource for making informed decisions about the economic practicality of solar generation sources for residential or commercial use based upon location, energy demands, associated fuel costs, solar energy system costs, and tax incentives. It is the actual cost of such systems, the resultant economic savings, and an understanding of their proper applications that should be fully vetted before a decision is made to conclude whether or not solar is a viable energy alternative for particular situations. This book serves as a prerequisite to the ‘Do-It-Yourself’ books that provide guidelines and instructions for installing Solar Domestic Hot Water (DHW) and Photovoltaic (PV) systems. It’s important first to have a fundamental understanding of these two types of solar alternative systems and their economic advantages. An informed decision can then be made as to whether or not such systems are practical for specific energy demands and economical as a long-term investment. I have a diverse engineering and academic background in Engineering Physics, Electrical Engineering, and Business Administration. I’ve held positions as a systems engineer with Automation Industries working on the Poseidon Missile System, as a project engineer in Kalwall Corp’s Solar Division, and as a Department of Defense Branch Head in Control Engineering, Welding Engineering, and Quality Material Control Engineering Analysis. During a portion of that time, I was appointed by the University of Maine Physics Department to advise and assist in providing an industrial perspective for quality education. During my career I have received awards from the State of Maine Office of Energy Resources for Solar Engineering Design and from the Department of Energy for Energy Innovation and contribution to the Nation’s Energy Efficiency. As you can observe from the above, I am what might be considered as a ‘workaholic’. But I do enjoy other things. Since leaving the DOD, I have been able to start writing once again, and I enjoy doing so. I also enjoy working on home landscaping projects and having an occasional glass of wine outside (inside during the winter) with my wife on a sunny afternoon. We also read a lot, attend Tai Chi and exercise classes, enjoy spending time with our two grown sons, and simply enjoy being with each other. 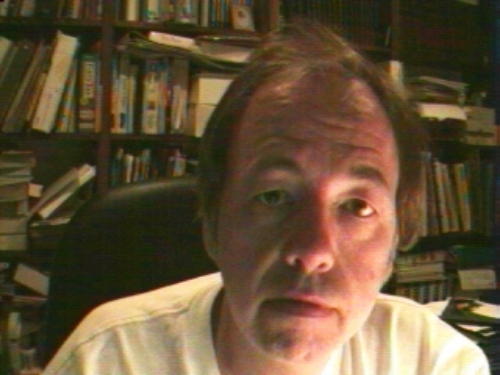 I usually devote several hours first thing in the morning to writing – sometimes also late at night. I write because I enjoy doing so. I also write to provide information and awareness of issues that I believe could be important for people to think about - sending a message - awareness. I've just completed a new novel (upper middle grade genre) entitled "JOURNEY HOME - A Cat's Tale". It's a coming of age story written as a first person narrative about a cat who tells you the story of his abandonment and the first two years of his life. The story examines the importance of hope, family, friendship, and overcoming hardships, and it explores the question of the impact of our lives on one another. We learn from our experiences which make us part of whom we become. I'm currently looking for an agent.I'm also two-thirds through the first draft of a new novel that is somewhat politically driven, science fact-based about people's inattention and unawareness to global issues. I believe many people will be able to relate to this story. I believe people need to understand how such alternative energy systems operate and importantly to understand the economics of it. In other words, does such a system save a person money. No one appears to have addressed that issue. And I thought it important that the use of solar energy systems doesn’t just disappear like it did in the early 1980’s. I considered that a sequel to my first book was needed. I also wanted people to understand and have a more objective perspective regarding the energy conundrum we all face. In addition, I found there’s a lot of confusing and incorrect information available on the Internet, and I wanted to provide a systematic approach to the knowledge that should be acquired before purchasing a system. I hope the publication of this book increases awareness and helps provide the solar industry a chance to become an on-going solution to our energy costs. I write in several genre’s, both fiction and non-fiction. The new novel I just completed (JOURNEY HOME) is a children’s/young adult novel based upon actual events of an abandoned cat and his journey to find a home. I chose it because I believe the story holds a lot of life’s lessons we learn as we grow from children to adults. The first draft of the current novel I’m also writing is completely different and somewhat political. It was inspired by true events with a story line that warns us about being apathetic and not paying attention to things happening around us. As I mentioned, there’s even a little fact-based science fiction involved as well. There was a lot of research (hundreds of hours) involved with analyzing technical information and developing tables and figures for my book “Solar Energy – Photovoltaics and Domestic Hot Water : A Technical and Economic Guide for Project Planners, Builders, and Property Owners”. I also interviewed solar installers and contacted many government agencies as well as received information from several Federal Reserve banks. The list of contributors is extensive. Even my last Chapter concerning the energy conundrum we continue to face included information from the EPA, Congressional Carbon Tax Bills, and other published reports. I think I become more creative the more I write. I also read other books and author’s works in order to fine tune my own approach and style to writing. It helps me to become a better writer. There’s always room for improvement. Probably putting all the information collectively in a format that would be of interest for both the technical reader as well as the non-technical reader. I purposely wrote the book so it would include usable information for every reader. I have applied actual situations and conditions to challenge the technical and economic aspects of this book. Examples chosen and discussed are real life scenarios and can be applied by anyone. The research and resources used were extensive. Having the book published by a well-known and respected publisher, and seeing the final product in print, knowing important information was available to everyone. I usually have an idea that I wish to embellish upon as a story. As I write that story, it takes on its own form and life that develops within itself over time. Sometimes I write fragments of Chapters which evolve into the story as it develops. Not much at this point in time. As I publish more, so will the dialogue among readers. All constructive input is always appreciated. I listen to what people say. I try to keep an open mind from comments I receive, even when I don’t like them. There were several comments from peer reviews of my solar book prior to publication that I didn’t agree with at first. But after consideration, found them to be necessary changes. I thanked all reviewers for their input and the opportunity to better the manuscript. "JOURNEY HOME - A Cat's Tale" is another example. Input from teachers who I don't know very well have had some interesting and helpful comments which I've incorporated. It's encouraging to know they've enjoyed the story and provide constructive comments. Yes – It helps. There are a lot of first time as well as seasoned writers who have a lot of suggestive and helpful hints. Not yet – I did have an editor for my solar book, provided by the publisher, but there were very few suggested changes to my original manuscript. I try to polish my manuscripts prior to submissions – perhaps too much so at times. As I mentioned before, it’s always good to get input from others. There comes a point in time, however, when you just have to stop writing drafts and self-editing because the words are never quite good enough. Once I get to my 2nd or 3rd draft, I ask my wife to read the manuscripts, and she provides me constructive feedback. I think it’s important to write what you know, so that you can develop believable story lines. The people you meet throughout your life always provide an interesting mixture in developing particular characters. I believe my mother who passed away too early in life was my greatest influence in how I see things. I think marketing yourself is more difficult and time consuming than writing a book. I believe becoming involved in social media applications is important so that people know you’re out there. My recent publisher suggested I become more involved with that aspect of the market. If readers like your works, then your audience will naturally increase over time. Establishing a website and author pages using sites like facebook, linkedin, google, goodreads, etc. are all important vehicles. This book was published traditionally. I’ll be searching for an agent for the recent novel I've just completed. And then once I complete the current novel I'm writing I'll either try to use the same agency or search for a new agent. I would like to find an agency that could handle everything I write. I have several other books in mind and they involve both fiction and non-fiction. I don’t anticipate a series, although I could write a sequel to "JOURNEY HOME". However, I already have another book in mind once I complete these current projects. Two books at once are enough to deal with at a time. This question is currently not applicable to this book. Take notice of your life on a daily basis. Write down things that matter to you and what your thoughts are. Notice people in your life and describe in detail those things you consider to be different. Time goes by very quickly. Savor those days while you are in them especially with your wife and children. There are several – but perhaps a book written by Homer Hickam, Jr.entitled “Rocket Boys”. That book inspired the film ‘October Sky’ which is also a favorite. The memoir related to my early days experimenting with amateur rockets. Of course there’s also books by Dickens, Vogt, Asimov, Dahl, Tolkien, and others and classic films like “The Return of the King” trilogy, “Uncle Buck”, and the first “Star Wars” movies – also favorites, and Zusack with his brilliant metaphors. I don’t have a book trailer – not a bad idea for future books – possible for the future, but not this one. I’d discuss that first though with my publisher, whoever that might be at the time. As I mentioned previously, I just completing the final polished version of "JOURNEY HOME" and am currently working on the first draft of a new novel (final title not yet available). I have others in mind, but we can discuss those at a later time. I usually stop and work on another project. Sometimes I’ll just continue to work on a story when it’s not flowing, knowing I’ll have to rewrite those portions. Eventually, it all comes together. Read a lot. Don’t force yourself to write. Let it come naturally. Don’t get despondent about rejections, although that can be difficult. Don’t give up. If writing is something you like to do, then do it. Russell H. Plante is an Engineering Physicist with a Bachelor of Science Degree from the University of Maine with a Minor in Electrical Engineering and post graduate courses in Business Administration. He has held positions at Automation Industries, Inc. as a Systems Engineer, the Solar Division of Kalwall Corporation as a Project Engineer, and the Department of Defense as a Branch Head in Control Engineering, a Branch Head in Welding Engineering, and an Engineering Analysis Branch Head in Quality Materials Control over a thirty plus year career. During that period he was appointed by the University of Maine to the Department of Physics Advisory Committee to advise and assist the Physics Department in providing an industrial perspective for quality education at the undergraduate and graduate levels. A skilled technical writer, he is a previously published author with John Wiley & Sons Inc. and Academic Press (Elsevier). He has also received awards for Design Engineering from the State of Maine Office of Energy Resources and from the U.S. Department of Energy for Energy Innovation Technologies. He is the C.E.O. of Applied Technologies, Inc. He resides with his wife, Kathy, in Kittery, Maine.